From last weekend’s work, here’s the last two stages of wiring. Then it gets cleaned up and attached to the interior of the SFS box. I use a LOT of waxed lacing cord. It makes for a very nice looking wiring harness and doesn’t snag on everything like a nylon wire tie will. 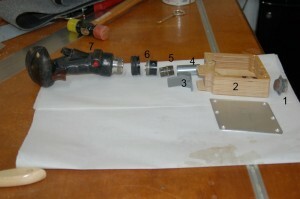 The next three photos show the completed SFS box with the grip attached. And finally, here’s what it looks like installed in the cockpit! 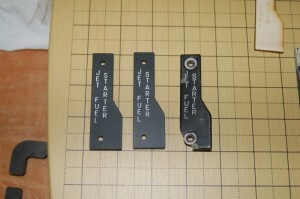 One of the things I got done was to finish the missing pawls for the throttle quadrant and get them installed. These pawls act as both an idle gate bar and as a trigger for the engine start switch. In order to pull back past the idle gate, you need to pull up on the finger lift. This prevents you from accidentally cutting fuel off to the selected engine when pulling the throttle fully aft. When starting the engines, you pull up a finger lift and the pawl activates a microswitch that in turn causes the JFS to link the AMAD to the selected engine. Here’s the new pawls – the originals were sold unfortunately. #1 is the idle gate. When the pawl is forward of it, you can’t pull the throttle arm fully aft without lifting the pawl over it. #2 is the engine start switch. When the pawl is aft of the idle gate, pulling up the finger lift will cause the pawl to engage the switch. The sides of the pawls are 3D printed from ABS plastic. I may replace those printed parts with machined aluminum before installation back in the cockpit. The other thing I got accomplished was the fitting out of the SFS box! That’s been a long drawn out project for sure! I got the Nosewheel Steering/AP Disconnect paddle & switch installed on Saturday and I completed the wiring & other assembly this evening. 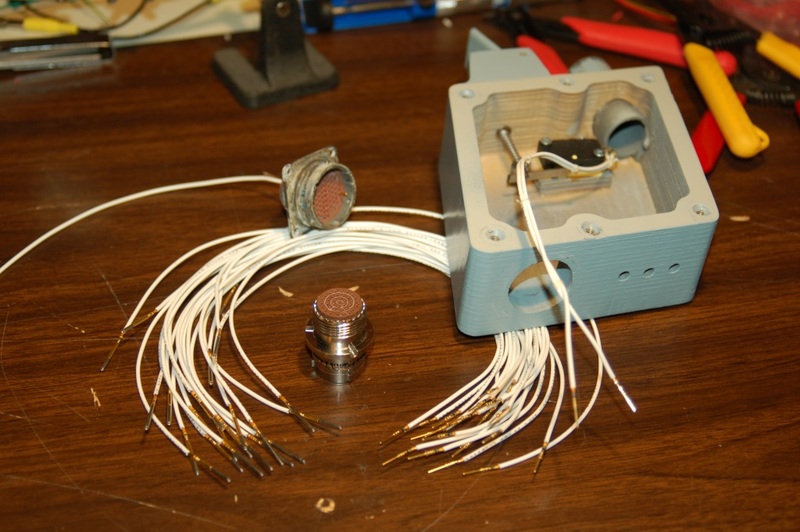 All that remains is for the bottom connector to be screwed into place and then the wiring needs to be wrapped up in lacing tape and tied to the interior of the SFS box. The final step will be to install the machined Delrin installation post I made a few years ago and get it properly drilled so I can bolt the SFS box to the lower stick assembly. That should be done this coming Saturday and I’m really, really looking forward to it! So what happend to that poor F-15 anyway? That’s video of the airshow where the accident occurred that resulted in the cockpit section being snapped off the aircraft just aft of Bay 5. I’ve probably linked to this video before, but I figured someone that had never seen it before might be interested. The font isn’t exactly right, but it’s all I’ve got to work with. All the searches I’ve done for the right font only come up with the one that Derek Higgs did for the Simpits group in 2000. Hopefully tomorrow I’ll post pics of the replacement TEWS panel. Way back in March, I showed the starting process to how I built new edge-lit panels for the F-15. I finally was able to get enough time away from doing 3D printer work to get some panel work done! 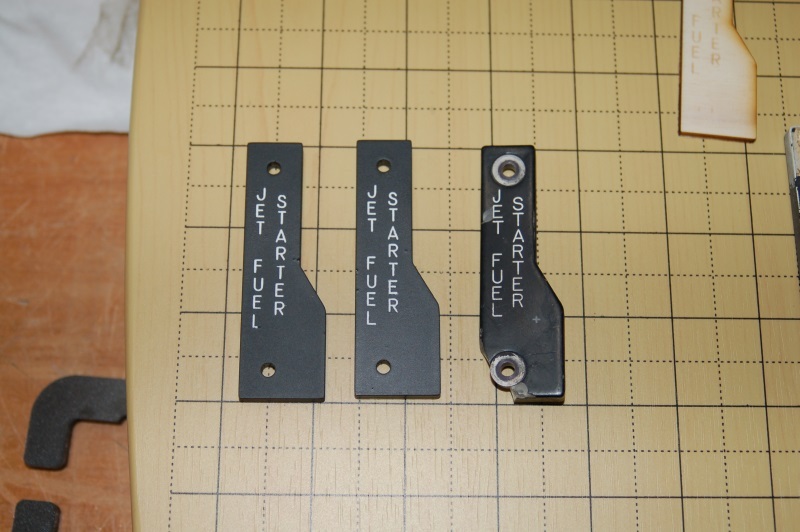 Here’s the new Jet Fuel Starter panels. The new panels are on the left, the old panel is on the right. There’s a few differences between them, but they’re dimensionally identical. 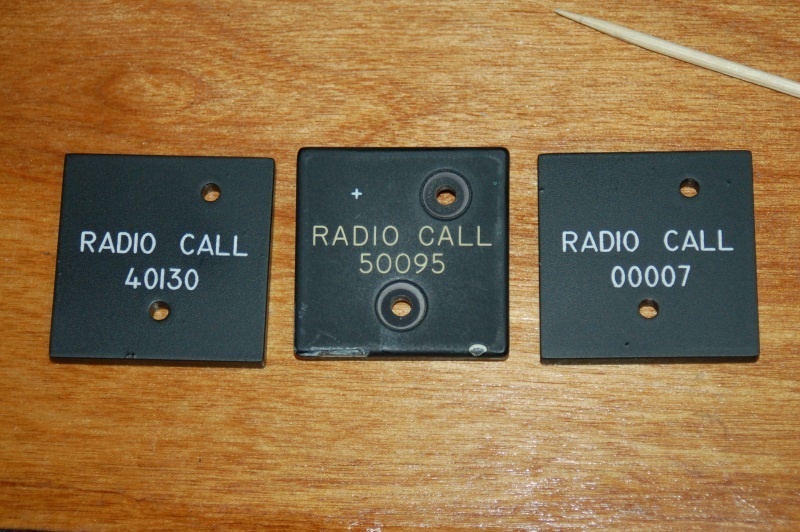 The “L” on the far left panel didn’t completely engrave, so I’ll need to touch that up by hand. This was my first go-round at doing two-color panels. There was some paint bleed and in a few points, masking failure. I’ll touch these up by hand using a magnifying glass and a very fine detail brush. If you didn’t know, the real panel is in the center. I’ll post pictures of the other panels when I’ve got them completed. 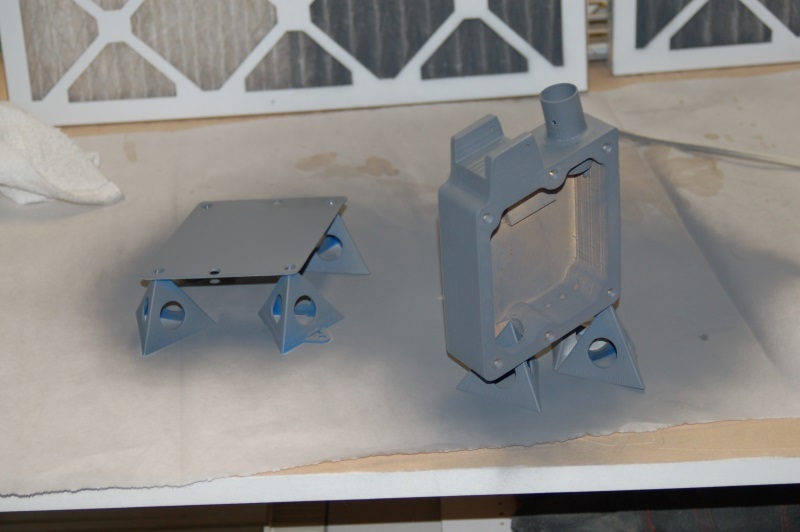 I think there’s only one more to finish – it’s a two-color panel as well and fits on the fire suppression panel. 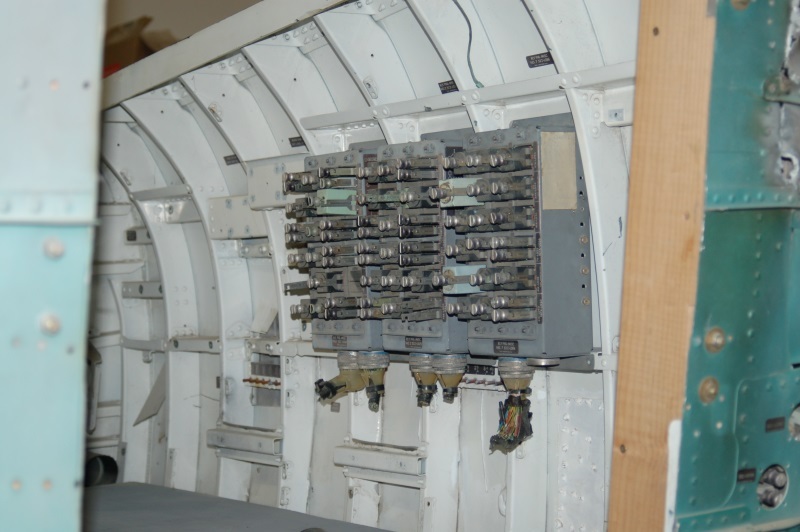 The flight control system on the F-15 is a cross between a fly-by-wire system and a standard hydro-mechanical system. 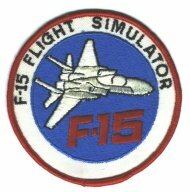 The F-15 has a system called the CAS, or Control Augmentation System that combines the best features of the old and new styles of flight controls. 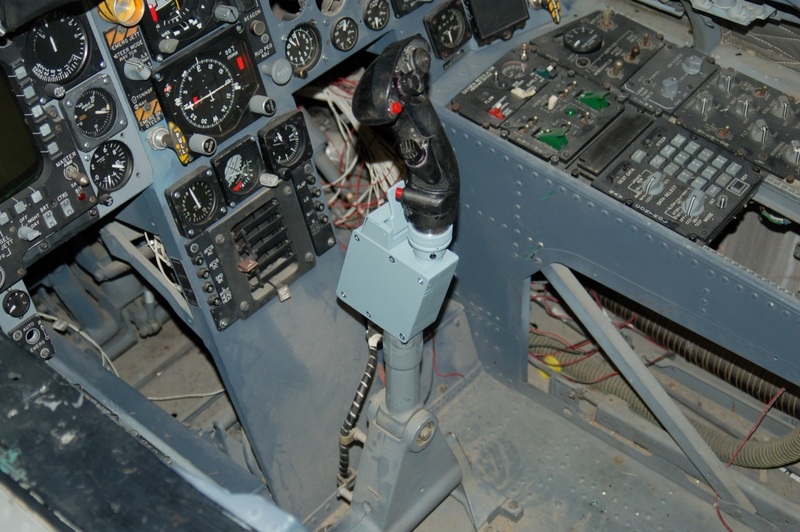 In order to accomplish this, McDonnell-Douglas needed a way to detect the amount and direction of force the pilot was applying to the flight grip. 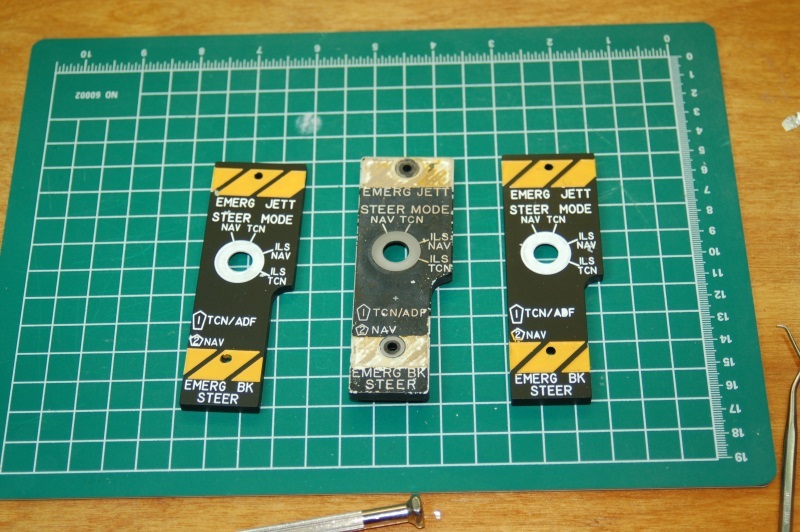 This is how the SFS or Stick Force Sensor box was born. This box not only joins the grip to the stick base, but also contains a “load beam”. 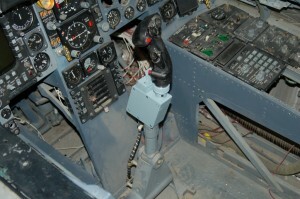 This is a special electronic device that tells the flight control computer how much force the pilot is applying to the stick and in what direction. The SFS box also contains the Autopilot Disconnect and Nosewheel Steering paddle. 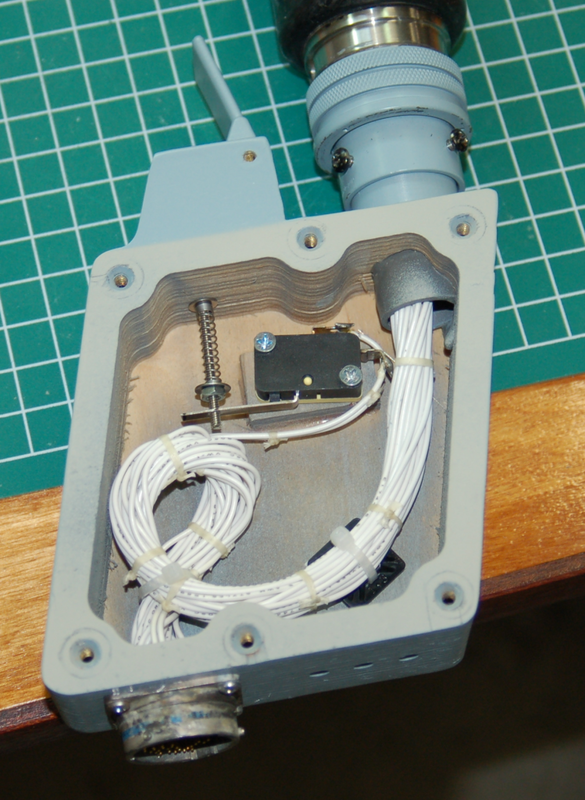 Part #1 – the 57 pin cannon plug was part of the original wiring harness for the SFS box. However, instead of being mounted to the box, this connector was attached to the cockpit floor with four screws. The other end of the cable (not shown) was a 57 pin cannon plug that mated to the SFS box itself. 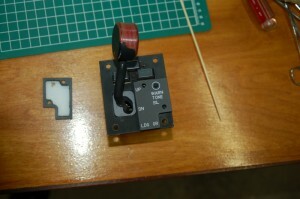 I’m going to rebuild the harness using a different connector to pass the wiring through the cockpit floor and use the original parts to build a visually correct SFS box. 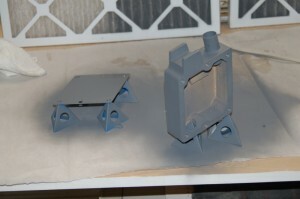 Part #2 – the machined SFS box was covered here a number of years ago. Other projects and an ugly case of Stage IIIB lung cancer put the whole thing on hold for a long time. Part #3 is a pretty good replica of the original AP/NWS paddle. I printed it on my Rostock MAX 3D printer. The part is 30mm tall and 30mm wide at the base. It’s not an exact copy of the paddle, but it’s pretty close! Part #4 – the “load beam” is simply a short piece of 3/4″ EMT that’s been turned on a lathe to increase the inside diameter a bit in order that the 57 pin cannon plug (Part 5) can fit inside. 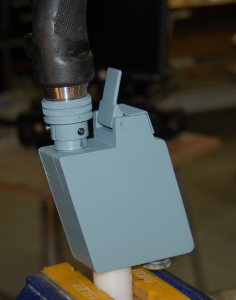 Part #5 – the 57 pin cannon plug mates to the keyed socket on the flight grip. Part #6 – the lower ring is custom fabricated by a friend of mine and the threaded ring was a donor part from another aircraft. Fortunately the USAF loves their standards, so most of the parts at that level are the same with respect to thread diameter and pitch. 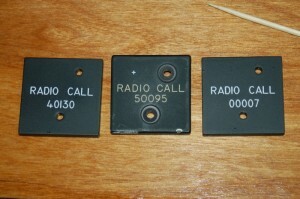 I’ve got the pinout for the grip and I just need to verify it with a meter. Once I’m confident that I have a 100% good pinout and all the switches work, I’ll build the harness that joins the two cannon connectors together and then permanently mount the connector to the bottom of the SFS box. 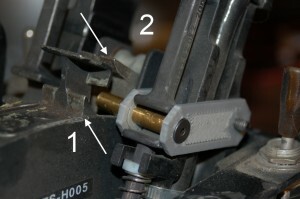 Not shown is a Delrin post that bolts to the bottom of the SFS box – this is what mates the SFS box to the lower stick mechanism in the cockpit. 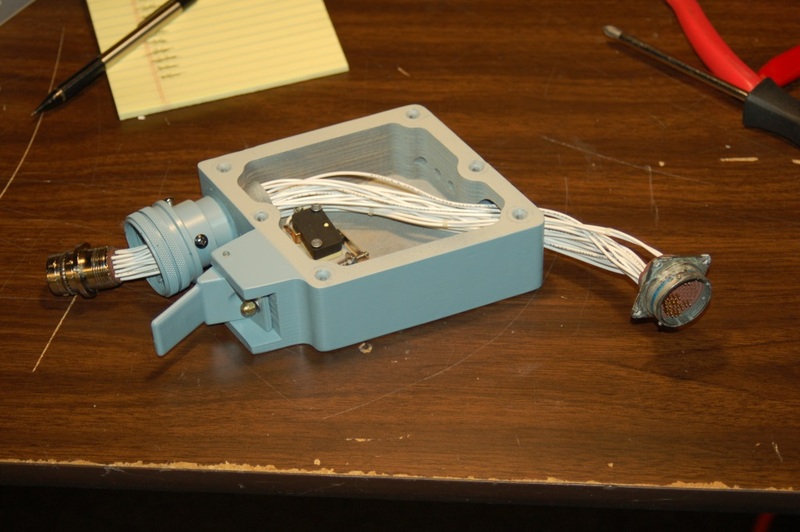 “Beam” mounted to the SFS box. I’m going to add a smaller support piece in there to help protect the tube against aggressive back-force. It’s well supported to the rear, but not to the front. 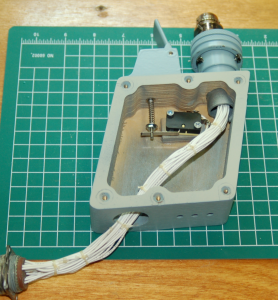 The little square of material you can see is where the micro-switch for the AP/NWS paddle goes. 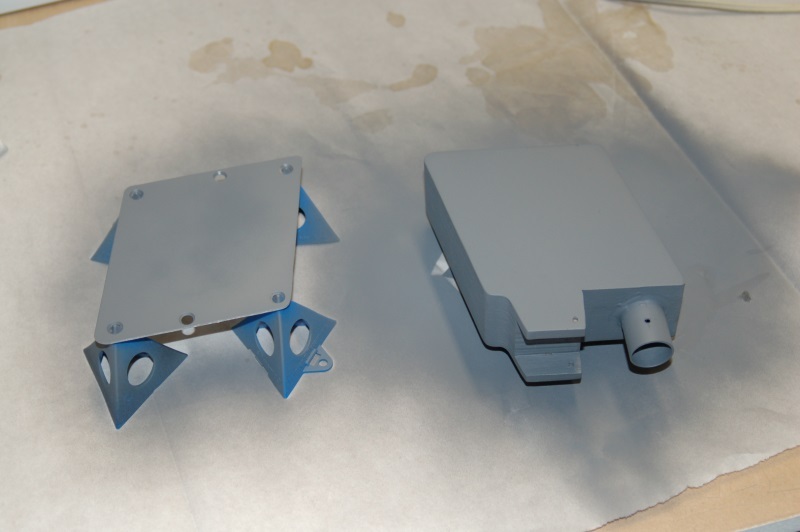 SFS painted with a first coat of primer. I used a Krylon flat primer and before I install it into the cockpit, I’ll shoot it again with the correct FS color that it should be. The grey primer isn’t light enough. After many years of being disconnected, the flight controls are getting worked on! Now that I’ve got a 3D printer, can I easily make things that would be a costly nightmare to have fabricated by someone else, or done myself in metal. 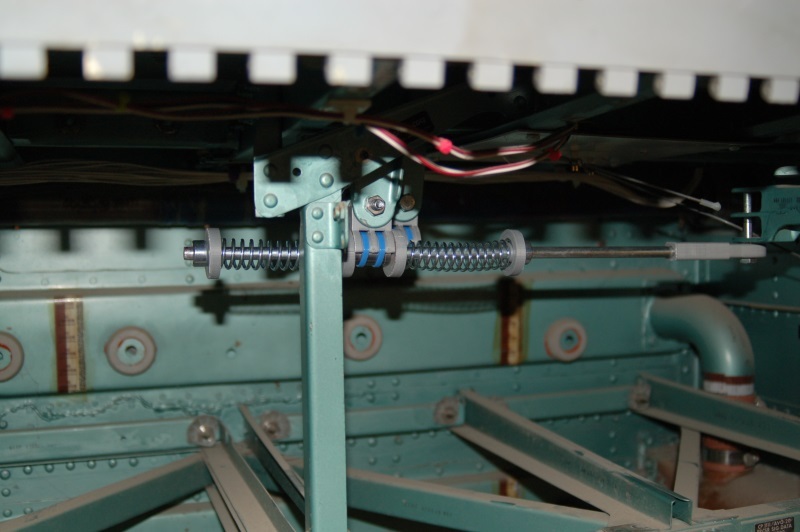 A good way to make a stick centering mechanism is to have a pushrod loaded with springs on either side of a bearing point. This is what I did with the flight controls in my 109F/X cockpit and it works great on the F-15! The grey parts in the image were printed on my 3D printer (a Rostock MAX by SeeMeCNC – http://www.seemecnc.com). 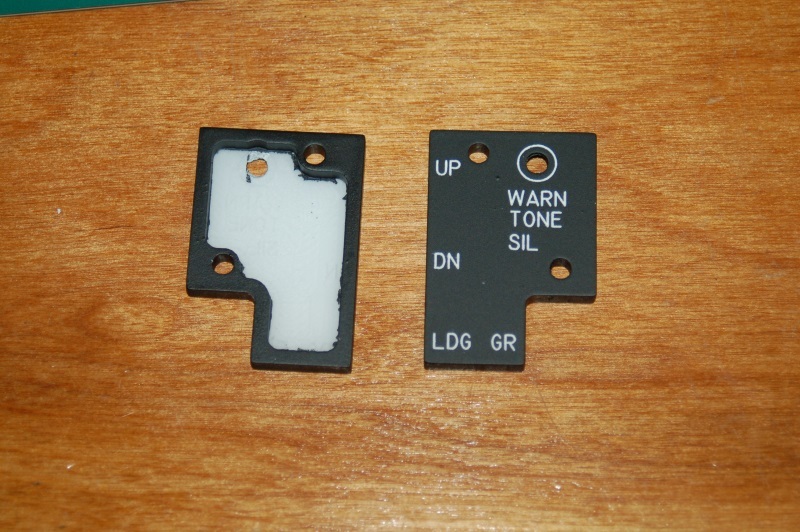 The center point holds an LM8UU linear bearing. 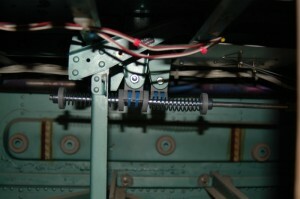 The bearing is held in place using a pair of wire ties. Since the bearing doesn’t receive any twisting or side-force, this is a perfectly adequate method of retaining the bearing in the mount. The pushrod is a 5/16″ plated rod that makes it about 7.95mm in diameter – a perfect fit for the linear bearing! 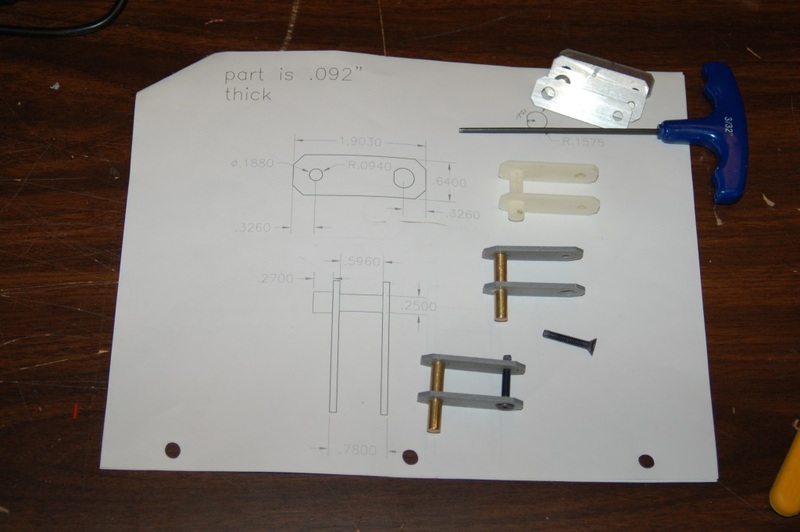 The rod end is printed because I couldn’t find one that would take a 5/16″ rod, but had a 1/4″ hole in the end. The roll axis fork is drilled for a 1/4″ bolt and I didn’t want to increase the size of it. The grey caps keep the springs centered on the shaft and prevents the springs from coming into contact with the pushrod, resulting in a nice and quiet system. The springs I used may have to be replaced, they’re _almost_ too stiff. Once the SFS box and grip are installed, I’ll know for sure if I have to go to a lighter spring. The pitch axis centering will be installed later – I didn’t have the parts ready when I took pics of it on Saturday (3/16/13) – I’d forgotten to print four more end caps for the spring! The SFS box and its metal top were sanded to final shape and finish on Saturday and the SFS box got a coat of Shellac to seal it in preparation for painting. I also got the hole bored for the SFS cable connector that connects to the bottom of the box. Pics on that next week! Updates and making new panels. After a very long time away from the project, I’m finally getting back on track with the F-15. Rob has done an excellent job in cleaning up the canopy for installation. The replacement trim has been rough cut and only needs final finishing and pilot holes drilled. Then it can be installed & painted! This past Saturday, I was finally able to get the ShopBot cranked up in order to start making replacement edge-lit panels that I needed, as well as some that Steve’s Kansas F-15A needed as well. These were cut out of a 12×12 sheet of .236″ acrylic. The next step is to “de-panelize” them and prepare them for painting and laser engraving. Unfortunately, due to my ONGOING shop furnace issues, I still can’t paint in the shop yet. The material the acrylic is on is “Coroplast”. It’s essentially plastic cardboard. I use an aggressive double-stick tape to hold the acrylic in place while I’m cutting it. The Coroplast is held in place by the vacuum system on the ShopBot. I can cut through the first layer of the plastic without comprimising the vacuum seal. 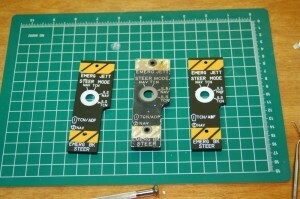 This is the best method of cutting both acrylic and non-ferrous metals on the ShopBot. It allows for a very good material hold-down without having to use traditional mechanical clamps that could be struck by the tool on accident. 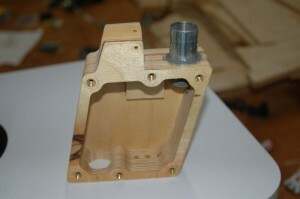 It also allows for cutting very small parts that would be impractical to hold down any other way. Right now, my Rostock MAX 3D printer is printing the first part for the new stick centering mechanism. The part holds an LM8UU linear bearing and will act as the center of the new system. I’m using Silver ABS. This particular part is for the roll axis. 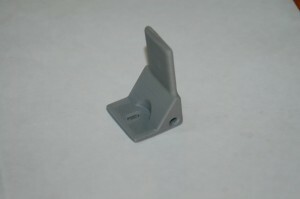 There are two different designs because the mounting points are a different size. 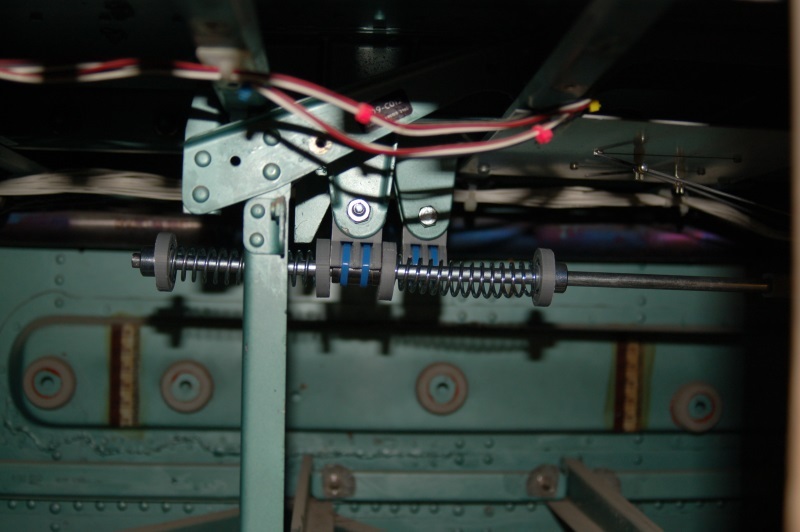 The space between the bracket arms on the roll axis are 14mm, while the pitch axis spacing is 12mm. These are existing features in the underside of the cockpit that I’m using. I don’t know their original function, but they line up exactly with the pitch and roll output arms that exit through the cockpit floor. 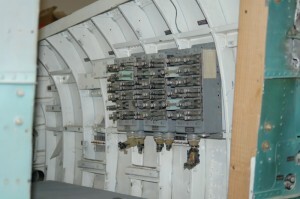 The trim pieces on the canopy are missing most of their screws. The screws used are a reduced head, “hi-torque” coin-slot fastener. Finding these things has been one hell of a chore.